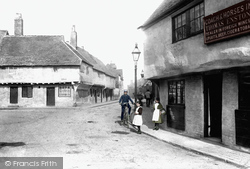 Explore all the places you remember! How to keep in touch with us. 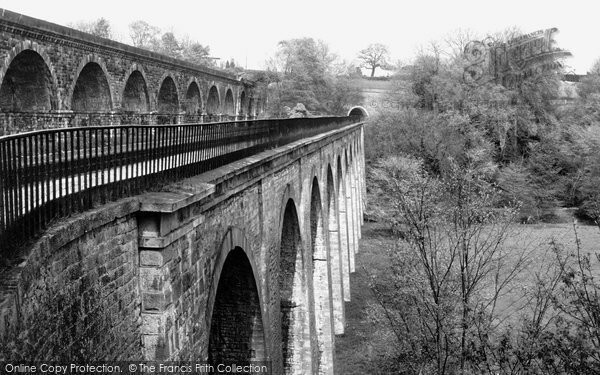 A special showcase of photos of some of our most stunning and stately viaducts, selected from The Francis Frith Collection. In the late 19th century, local landowner Maryon Wilson planned to turn Hampstead Heath into a residential estate. He built the Hampstead Heath viaduct to use as the entrance to his planned estate, but local people were against the idea and successfully battled against Wilson in one of the first land preservation campaigns. The Heath was saved from development and Wilson’s estate was never built, but the five-arch red-brick bridge viaduct still stands today, and carries a narrow roadway across the pond in the south west angle of the Heath, although the stone balustrade has given way to a plain iron railing. 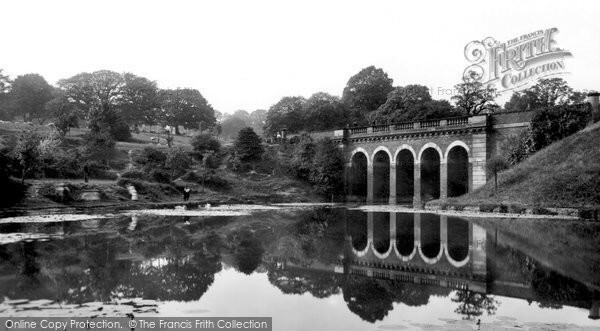 Photo: Hampstead, Viaduct And Pond 1898. Here we have a world-famous scene: the peaceful River Nidd dominated by the 338ft-long railway viaduct at Knaresborough. The original viaduct of 1847 collapsed after heavy rain, and was rebuilt three years later. Overlooking this view are the remains of Knaresborough Castle, destroyed by orders of Parliament in 1644. 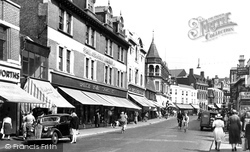 Houses at the top of this picture date from 1721. 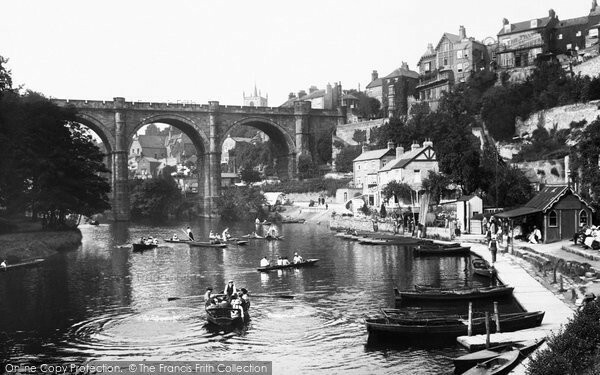 Photo: Knaresborough, River Nidd And The Viaduct 1921. The forbidding shape of Dartmoor rises in the background of this early view of the Great Western Railway viaduct over the River Erme near Ivybridge in south Devon. This view shows the original viaduct that was designed by the great Victorian engineer Isambard Kingdom Brunel and built in 1848 for the South Devon Railway, which became part of the Great Western Railway in 1876. It was constructed on granite piers with an upper superstructure of timber. One of the most beautiful of Brunel’s wooden viaducts, the elegant structure was described in ‘Murray’s Handbook for Devon and Cornwall’ of 1859 as ‘a spider-like fabric of such slender proportions that one wonders it has not been blown away into the moor... a black wooden roadway, which is carried in a curve over ten pairs of white granite pillars, each pair being sixty feet apart, and the most elevated a hundred and fifteen feet above the valley.’ Brunel’s viaduct was replaced in the 1890s with the impressive stone structure that now carries main line trains connecting London and Penzance across the Erme valley, but remnants of the granite piers of the earlier viaduct can still be seen standing alongside it in Longtimber Woods, off Station Road. Photo: Ivybridge, Vicarage And Viaduct c.1876. A Manchester-bound passenger steam train has just emerged from Headstone Tunnel and is thundering over the curved Monsal Head Viaduct over the River Wye at Monsal Dale in Derbyshire’s Peak District in this view from 1914. This stately five-arched structure was built as part of the ambitious Midland Railway linking Derby and Manchester through the valleys of the Derwent and the Wye in 1863. The Midland Railway line is long closed, and the viaduct now carries the Monsal Trail for walkers, and is a protected building. Photo: Monsal Dale, Train Crossing The Viaduct 1914. 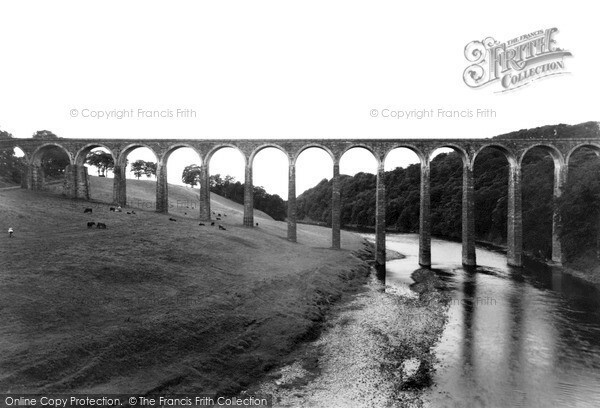 This single-track railway viaduct in the Scottish Borders is also known as the Drygrange Viaduct. It was opened in 1863 to carry the Berwickshire Railway over the River Tweed near Melrose. Each of its 19 tall red sandstone arches measures 43 feet (13 metres) in span; the tallest is 126 feet (38 metres) above water level. 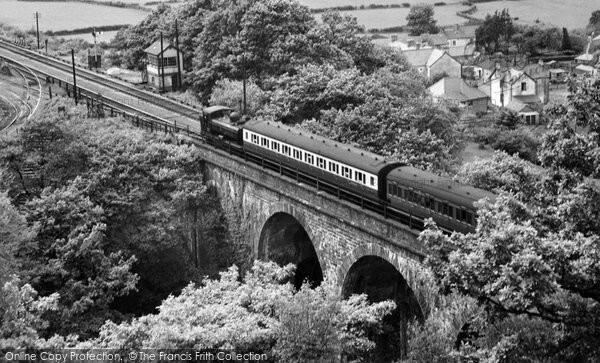 The railway line closed to passenger traffic in 1948 but freight trains continued to run across the viaduct until 1965. The poor condition of the viaduct caused it to come close to demolition in the 1980s, but it was upgraded from Category B to A listing in 1986. The viaduct was renovated in the 1990s and Historic Scotland took over control of this impressive structure from British Rail in 1996. 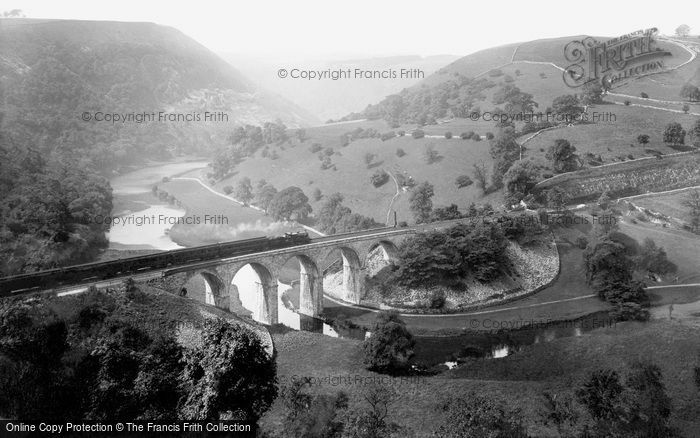 Photo: Newstead, Leaderfoot Viaduct c.1955. 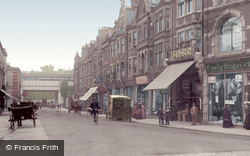 A rail connection made with Par in the 1870s gave Newquay direct access from the Great Western Railway, and therefore a boost to the town’s potential as a seaside tourist resort. 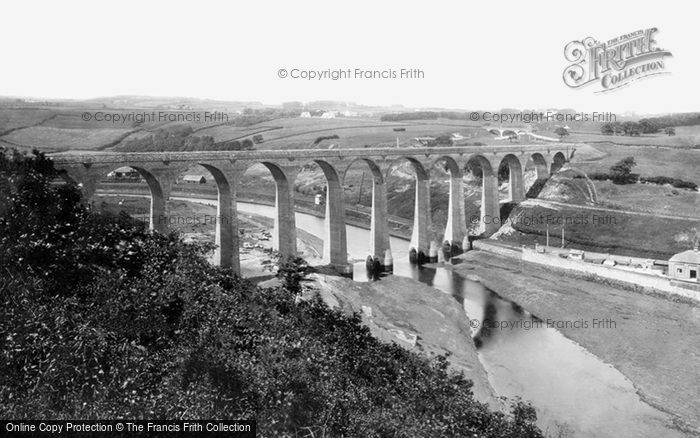 The railway into Newquay crossed the Trenance valley on a viaduct, first with stone piers carrying a timber trestle top, later replaced by iron girders (as seen here) and finally rebuilt with stone arches in 1939. 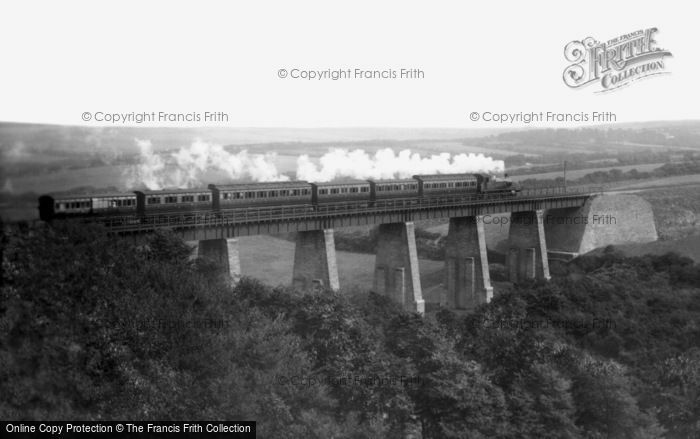 Photo: Newquay, Steam Train On The Trenance Viaduct 1907. The viaduct was originally erected for the Scarborough and Whitby Railway. The first brick was laid in 1882 and the first locomotive crossed the thirteen-arched viaduct in 1884. Trains from Scarborough crossed the viaduct, stopped at West Cliff and then reversed steeply down beneath the viaduct into Whitby. Photo: Whitby, The Viaduct 1884. The beautifully proportioned Chirk Aqueduct in North Wales was built between 1796 and 1801 at a cost of £20,898, and carries what is now the Llangollen Canal 70 feet above the River Ceiriog for a distance of 710 feet. Running alongside the aqueduct is the 100ft-high Chirk Viaduct, built to carry the Shrewsbury and Chester Railway line. Erected between 1846 and 1848, and rebuilt in 1858, it was the work of the Scottish engineer Henry Robertson. 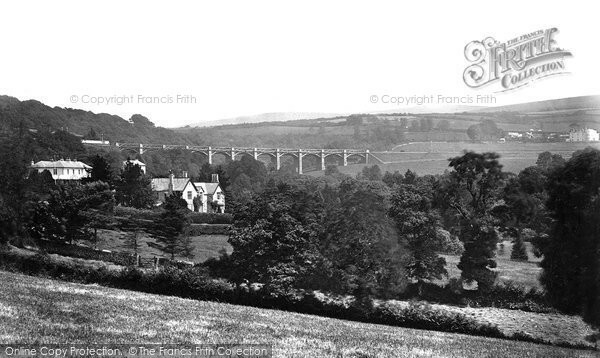 Photo: Chirk, Aqueduct And Viaduct, Ceiriog Valley 1939. 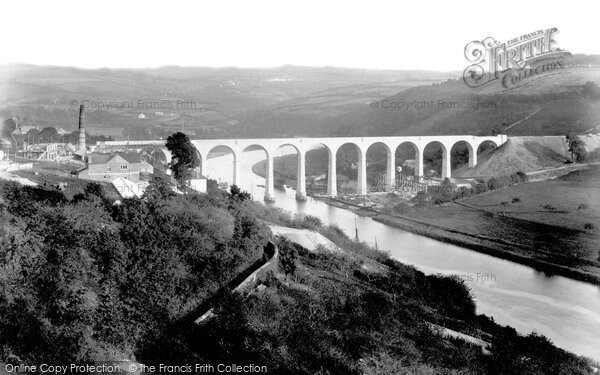 At this date the building of the new 12-arched viaduct across the Tamar is nearly finished, and the construction yard can be seen below on the Devon (right) bank. After opening in March 1908, the inhabitants of Calstock and the Callington area could travel by train direct to Plymouth. The tall chimney on the left is at the Calstock fire brickworks. Built to carry the Taff Vale Extension railway across the Ebbw and Kendon valleys to join the Taff Vale and Newport, Abergavenny and Hereford railways together, the 200 foot-high Crumlin viaduct was a 19th-century testimony to the economic power of coal. Designed by Thomas Kennard, the eight-pier viaduct was constructed by Charles Liddell, using castings from Falkirk and wrought iron from nearby Blaenavon. Construction began in 1853 and was finished in 1855, although the viaduct only came into service a year and half later. Demolished after the 1964 closure of the railway it carried, the elegant structure now exists only in photographs such as this. Dating from 1857, the viaduct at Glyn Neath once carried one of the busiest railways in South Wales. The line is long-since closed, but this towering sixteen-arch structure stands as a lasting reminder of Victorian skill and energy. 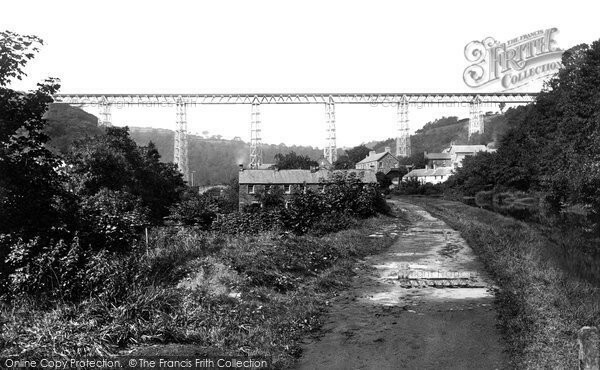 Photo: Glyn Neath, The Viaduct c.1955. This post has the following tags: Archives. You may find more posts of interest within those tags.